Have you ever really looked forward to something only to have something come up to kind of ruin it for you? Ya, that happened to me at the Margarita Fest. But not because the Fest wasn’t a great time! I got up early that morning and headed out to Color Me Rad (which was, you know, rad) where I felt great and had a really fun time with the family. I went home, had some food and a shower and headed out. Waiting in line to go into the Margarita FestivaI I started to get a little headache, but no big deal. We headed straight away over to the shaded VIP tent to grab some margaritas and beer. Thanks to running into Denise of Run DMT I knew to grab 2 drinks to avoid getting back in line so quick; I got a Grand Mango Jalapeno Margarita and a Grand Prickly Pear Margarita. I’d never had a jalapeno margarita before, and I gotta say it lived up to the hype. Ya, I know this picture is too big but I just found out I could embed a picture from Instagram so how could I not? After we sat and drank our first drinks (I do NOT have the coordination to walk holding 2 full drinks and not spill one or both) we headed over to the Taco Bus. I was super excited because I am for sure the last person in Tampa to try their food and what do you know, there they were. Couldn’t be more convenient! But then. We were in line for about 10 minutes (the other food trucks barely had lines, a testament to the addiction this place causes) and I realized I wasn’t going to make it to the front of the line. I asked my boyfriend if we could run back to the car for some Tylenol and come back, which we did. I grabbed another jalapeno margarita and we sat in the shade listening to the band and people watching (always, always fun at these events) for about an hour. I didn’t drink my margarita but I did enjoy myself. Unfortunately as soon as we got up and walked back into the sun my headache firmly reinstated itself as the boss of me and we decided to go. 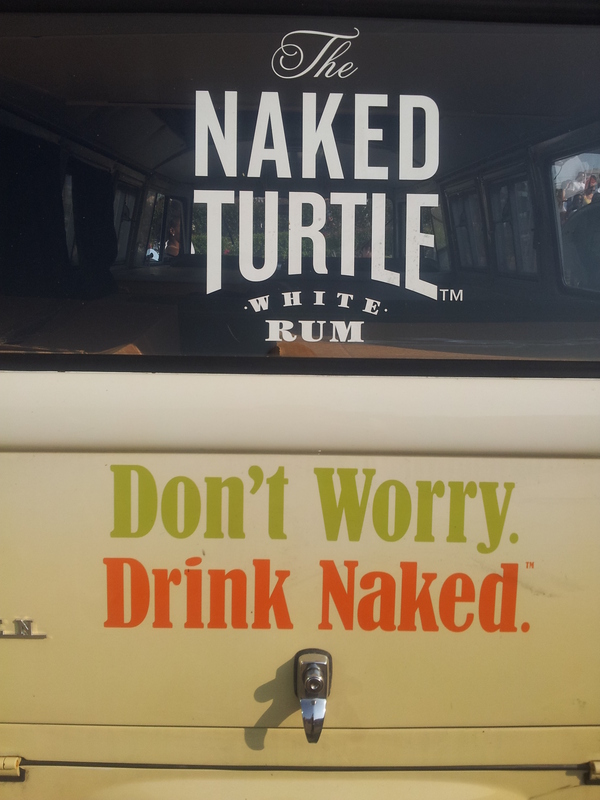 So no Taco Bus, no traditional margarita (tequila is my all time favorite drink), no Naked Turtle (I also love rum. Don’t judge) and no more fun for me. I spent the rest of the evening staring at but not watching the TV patiently(ish) waiting for the stupid headache to go away enough to sleep. Wanna know the worst part? This was my turn to not be the designated driver and I only drank one full margarita! What did I do to make karma strike at me like this????? As my 3 year old nephews would say, so sad. Since I didn’t get to enjoy much of the festivities here’s some links to check out what some other Tampa Bay Bloggers thought. Spoiler alert, they thought it was great. Anyways, long story short it was an amazing event and the people who put this on are doing it again August 16th – this time it’ll be the Summer of Rum. Here’s hoping I’m not the designated driver for that one and I get to torture people with drunk tweets! Have you ever looked forward to an event and then had to make the decision to opt out? If you are here in Tampa are you planning to go to the Summer of Rum Festival? If so check back here closer to the festival, I may have some general admission tickets to give away! This entry was posted in Just Zennish and tagged Margarita festival by Kinda Zennish. Bookmark the permalink. Ooh hope your headache is better. Usually it;s a sick kid that ruins it huh? I’m always the designated driver not a big drinker. I really need to do one of these color runs but they never seem to be at a good time for me. Try a color run if you get the chance, they are a lot of fun! I didn’t know you were in Tampa! I’m an hour south! I missed the margaritas festival but plan on attending the rum festival. That jalapeno one looks interesting! I’m actually a bit north of Tampa, but close enough. Only 2 months till the summer of rum!